In 1992, personal trainer Phil LiCastri moved here from New York. He figured a good way to learn the area was to volunteer. He found Elderhouse in Norwalk, and taught a chair exercise class. He’s been doing it twice a week ever since. In 1997, Phil and a partner opened Fast Fitness. It’s still in existence. But in 2005 he started Pinnacle Health & Fitness, near Shake Shack. It’s not far from the Lansdowne and Regents Park condos. Older residents there have found a warm welcome at Pinnacle. 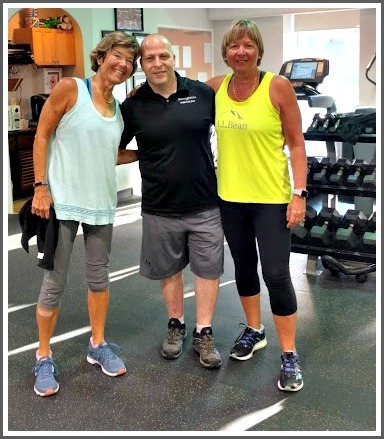 Kaye May (left) and Pam Gau have trained with Phil LiCastri (center) for nearly 2 decades. A lot of trainers want to work with younger athletes. Phil does too: In his spare time, he coaches the Joel Barlow High School wrestling team. But he loves the challenge of the aging population. He remembers fondly a retired high-level TV executive, who was battling Parkinson’s. “He had so much knowledge, and such a love for life,” Phil says. At first he walked slowly in. Later, he came in a wheelchair. An engineer with cancer came throughout his chemo. He too had a great will to live. And — like the television exec –both were at Pinnacle the week before they died. 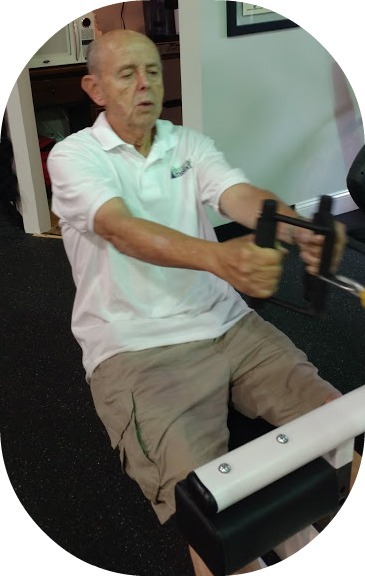 Phil trained a retired eye surgeon beginning at age 80. He was a client for 14 years. Now he’s 95. The other day, Phil visited him in the hospital. Current clients include 87-year-old Bernie Perry, a travel writer and photographer who 2 years ago wanted to build up his leg strength and endurance, so he could carry 15 pounds of equipment to Iran. Bernie Perry works out at Pinnacle. Another 87-year-old, Mel Hyman, still runs a company in Florida. He spends a week there every month, overseeing production and the warehouse. An 83-year-old woman is an educational consultant for children’s television and movies. An 84-year-old teaches writing at a college in Manhattan. Pinnacle is different from other fitness clubs in another way: It has no member fees. His staff includes yoga and aerobics teachers, a kettlebell competitor, a Romanian national track champion and a boxing instructor, among others. Phil’s clients inspire him. “If they can do what they’re doing, I want to help everyone I can,” Phil says. This entry was posted in Local business, People, Sports and tagged Phil LiCastri, Pinnacle Health & Fitness. Bookmark the permalink. Phil is the best. He is a true humanitarian and one of the kindest individuals you will ever meet.